Brigantine Beach, located in Atlantic County, is a beautiful barrier island situated 4.5 miles north of Atlantic City, New Jersey, and 56 miles southeast of Philadelphia, Pennsylvania. A seashore residential community, Brigantine Beach is a 6.4 square mile island bounded by the Atlantic Ocean, Brigantine Inlet, Absecon Inlet and inland waterways. Brigantine Beach is just minutes away from Atlantic City's endless casino entertainment and world famous boardwalk. There are 9,450 year round residents that call Brigantine Beach, New Jersey home. 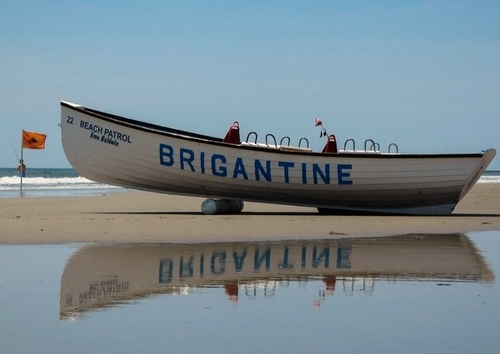 New Jersey's best kept secret, Brigantine Beach is a beautiful pristine barrier island where families come to enjoy a friendly, safe, beach haven. You can not help but fall in love with the wide, sloping white sandy beaches and friendly close knit community atmosphere. While traveling over the bridge that connects the mainland to our beautiful Island, you will instantly feel all the stresses of the day just melt away! "Brigantine Beach...an island you'll love for life" is our town slogan, and could not be more true. Once you visit, you will not want to leave! If it's nightlife you crave, say no more and look no further! Just a two minute bridge crossing puts you in the heart of Atlantic City, where all the nightlife, shopping, and fine dining you could possibly desire, awaits! Atlantic City is a seaside resort and gaming capital of the east coast that hosts 30 million visitors a year, making it one of the most popular tourist destinations in the U.S. Atlantic City is a thriving destination featuring world-renowned casinos and hotels, brand-name restaurants, unique attractions, headliner entertainment, championship golf, relaxing spas, upscale shopping and much more. Just an one hour from Philadelphia and two-and-one-half hours from New York City, which makes it the perfect complement to those destinations. Rail service provided by New Jersey Transit arrives and departs through the rail terminal adjacent to the Atlantic City Convention Center and Philadelphia’s 30th Street Station. The sparkling lights, sizzling nightlife and world-class gaming draws a myriad of visitors to Atlantic City for fast-paced excitement and fun, day after day. Plan a trip today because whether it’s daytime or nighttime, there is always something to do in Atlantic City. From beach bars, fine dining and the beach - to casinos, nightclubs and golf. To learn more, call 1-888-AC-VISIT (228-4748). Ventnor City, New Jersey, in Atlantic county, is 31 miles east of Vineland, New Jersey and 55 miles southeast of Philadelphia, Pennsylvania. The city is located in the Atlantic - Cape May metropolitan area. Ventnor City has a population of 12,910. Ventnor City New Jersey is a city on the Atlantic Ocean Shore of Absecon Island, located in between Atlantic City and Margate City. 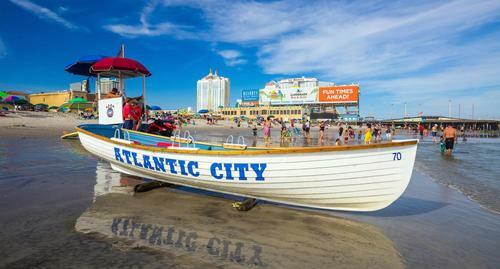 It is right next door to the shopping, gaming and night life found in Atlantic City, but also offers many family recreational activities, unique shops, restaurants and Bed and Breakfast Inns away from the crowds of it's neighbor. Named after Ventnor England, a very popular seaside resort established in the Victorian era on the Isle of Wight. 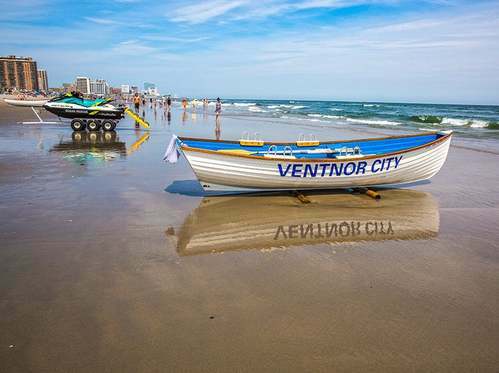 Ventnor City has large well maintained beaches that are almost always less crowded than their Atlantic City neighbor but still offer visitors and residents the same soft, white sand and great opportunities for swimming, surfing, kayaking and sail boating. The City of Margate is located on Absecon Island in Atlantic County, New Jersey, and is approximately 1.5 miles long and 1 mile at its widest point. It is bordered by Ventnor City to the Northeast and Longport Borough to the Southwest, with the Atlantic Ocean to the East and Beach Thoroughfare (the "Bay") to the West. Margate is a charming island community, with bay to one side, and beach to the other, with Atlantic City just 5.3 miles away. Margate offers residents and visitors ample opportunities for world class dining, entertainment and outdoor adventures. 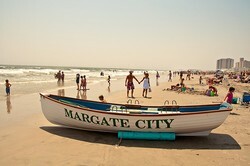 Margate is a popular Jersey Shore destination, especially during the summer. 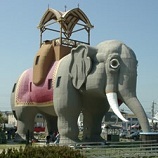 Margate City is the home of Lucy the Elephant, a six story historic landmark, which is the "largest elephant in the world." Marven Gardens, of Monopoly board game fame, is also located there. Longport is located in southern New Jersey, and is part of Atlantic County. Longport has 0.39 square miles of land area and 1.17 square miles of water area. As of 2010, the total Longport population is 895. One of only five New Jersey Shore towns located in Atlantic County, Longport is situated on the southern tip of Absecon Island. The borough encompasses approximately one half of a square mile of land area and is bordered by the bay on the northwestern coast and the ocean on the southeastern coast. Longport is named after James Long, the first owner of a large part of the land. Originally incorporated as a town in 1898, Longport offers a quiet atmosphere that is just a stone’s throw from the Boardwalk of Ocean City and the Boardwalk and high-end nightlife of Atlantic City. The beach at Longport is small, but impeccably clean with opportunities for sunbathing, kayaking, and surfing. Visitors will find this New Jersey Shore town to be the perfect combination of lazy day activities with the convenience of world-class nightlife nearby.